On July 21, 1969, PFC Roy Otis Buchanan arrived in Vietnam. He was assigned to a U.S. combat unit in Quang Ngai Province. In most cases, it’s almost impossible to find specific details about such men’s experience upon arriving, even if you’re lucky enough to find the unit’s staff journal/duty officer’s log for the day. The journal for PFC Buchanan’s unit, the 3rd Battalion 1st Infantry 11th Infantry Brigade is available on line. It contains detailed reports of incidents and actions as they occurred. You can learn from them that PFC Buchanan walked into the middle of intense combat activity. He probably had no opportunity to get used to the situation. He was very likely in combat almost from the moment he arrived. The journal for July 22 tells us that at 0305 (3:05 a.m.) a reconnaissance popped a trip flare. They threw grenades, and there appeared to be more explosions than from their own grenades, but they had no casualties. At 0530 sensors at a designated map coordinate picked up the movement of seven or eight enemy troops; the American soldiers responded with 12 rounds from a recoilless rifle. At 0920 two “Chieu Hois” (Viet Cong defectors) turned themselves in. One said he had escaped from ten VC with weapons and little food, and he expected them to “Chieu Hoi” soon. At 2210, an ARVN (South Vietnamese Army) unit engaged four VC, resulting in one VC killed, one M-1 carbine and five Chinese grenades were captured. 0805: Recon made contact with MAM (military aged men), two were carrying weapons. Recon received small arms fire, negative results. 0930: Recon in contact with unknown size enemy force, three VC killed, three AK-47s captured. 1130: B Company (PFC Buchanan’s unit) engaged unknown size enemy force resulting in six US WIA. 1235: B Company reports one US KIA from small arms fire. 1340: B Company reports one US KIA from small arms fire. 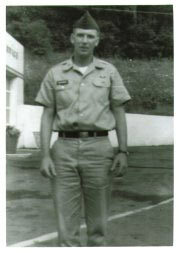 One of those had to be PFC Buchanan, killed just 18 days after arriving in Vietnam. His name will be remembered because of the Vietnam Memorial, but it seems as if no one will remember how he died.